It is particularly a huge jubilation in New York City which has a significant Mexican population and the residents of the city are always searching for an excuse to drink tequila! Whatever your reasoning for participating in the debauchery, there will be a lot of laughs, delicious, Mexican cuisine, tequila shots down the hatch, Corona beers flowing and of course the hilarious comedians at Comic Strip Live in honor of Cinco De Mayo. 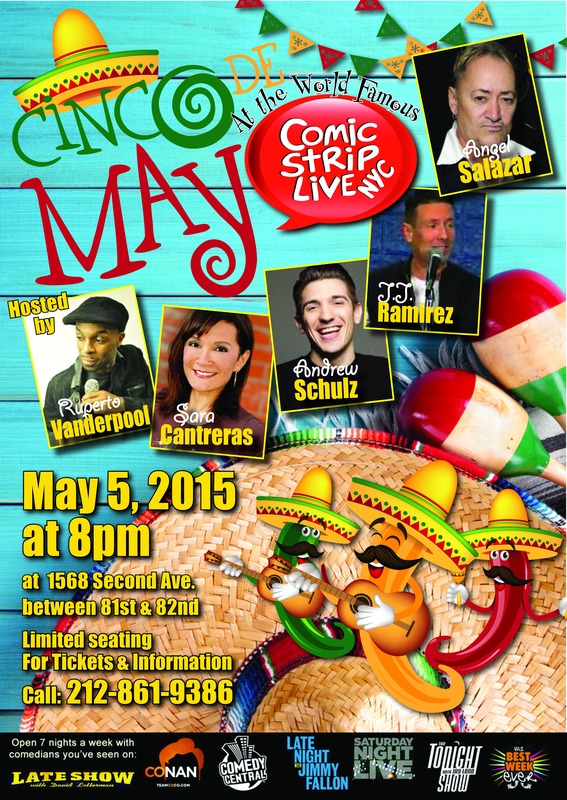 COMIC STRIP LIVE’S BASH will be the event to be at for Cinco de Mayo. Reserve your seats today before they sell out! Call us at 212-861-9386 or book online here. Ruperto Vanderpool, a natural born comedian who’s best known for his pantomiming humor and his endless variety of facial expressions. Born and raised in New York City the Bronx as son of Dominican parents, allowed Ruperto to be exposed to a diverse array of cultures that have provided him with many experiences, which today he incorporates into his stand up routine. “Funny things always happened in my house being that there were 8 of us.” It’s no surprise that he brings an extremely high level of energy, personality and style to the comedy stage that is hard to find today. At virtually every performance this former Brooklyn project girl keeps audiences begging for more of her witty, original, and hilarious writings. A comedic chameleon who can entertain everyone, from Christian to Adults Only, she is one of the country’s most popular comedians. Sara is also a trained actor with commercial, television, and film credits. Explore the site and don’t miss an opportunity to be part of the fun! You have seen him all over MTV, now see him life. Andrew Schulz is an actor, best known for Guy Code, and featured on Wild ‘n Out: Wildest Moments, Hip Hop Squares. With a highly successful podcast, Brilliant Idiots, Andrew is one of the most sought after stand-up acts in the NYC social and entertainment scene. As a matter of fact, Andrew Schulz is one of the fastest rising comedians in the country. So basically, you don’t want to miss this! A Cuban-American comedian and actor. He is known internationally for saying “Sheck it out” (check it out) before, during, and after jokes. He also co-starred with Tom Hanks in the film Punchline, and with Al Pacino in Scarface and Carlito’s Way. Salazar has also appeared on Last Comic Standing and many HBO Comedy specials. This manic,human laugh factory is rather difficult to describe. His Cuban heritage and penchant for sporting mini-skirts notwithstanding, Salazar’s performance is a mixture of street-smart ethnic wisecracks, risqué humor, physical comedy, and audience involvement. $5 dollar Corona and Corona Light! Comic Strip Live Brings the Fiesta to you!